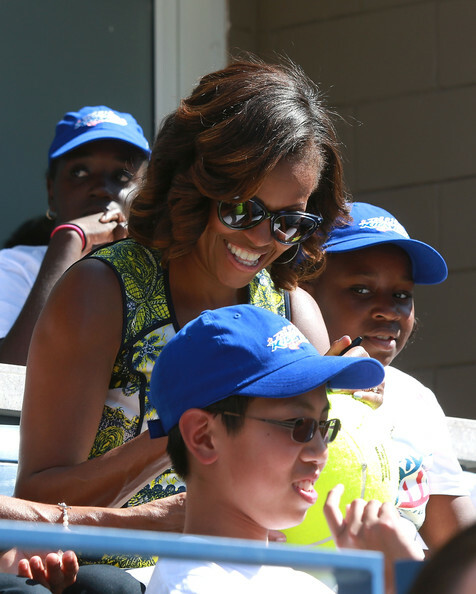 Arthur Ashe Kids' Day is an annual tennis/children’s event that takes place in the end of August at the United States Tennis Association at Arthur Ashe Stadium. (USTA) Center in Flushing Meadows, Queens, New York. It is sponsored by the Hess Corporation, IBM, and USTA. This event also begins the U.S. Open, which officially starts one day later. This event is also televised on CBS the following day. It is a celebration of the memory of Arthur Ashe, who died of AIDS in 1993, and of his efforts to help young people through tennis. Kids’ Day began in 1993, the year that Ashe died. Here is a file photo of the great champ Arthur Ashe posing with the Wimbledon trophy after beating Jimmy Connors in the 1975 final. So, today (24th August, 2013) was celebrated as the ARTHUR ASHE Kids' day at US Open & was attended by Rafael Nadal, Roger Federer, Serena Williams, Billie Jean King, USA's First Lady Michelle Obama, and other celebrities. More pics and videos to follow in the following posts. Thanks for all these amazing pics. Roger just looks so handsome, doesn't he? Well, I guess some of us are in for a week at least (hopefully 2 weeks) of staying up all night! The world and its time zones! I don't know about Roger but I'll be exhausted by the time it's over. Can't wait till tomorrow to see those guys in action! Roger Federer for ever and ever the best of the best in tennis! yes Rita Roger is handsome as always!!! please please Roger just win this one for all ur fans!